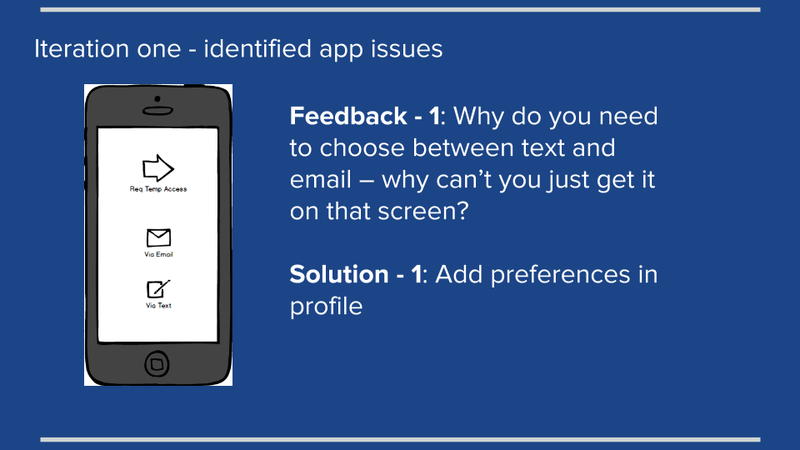 The following is a user-centered design project that was conducted for my Human-Computer Interaction master's program. This project follows the complete design process from problem-space researching, establishing design requirements, prototype design and creation, user testing, and design iteration recommendations. Users have issues with remembering codes and badges required for the secured environments. Also, there are workarounds with users piggybacking off of other users’ resources/protected information. How can we develop a successful solution that would transfer the burden from the stakeholders to the security system while keeping the environments secure? 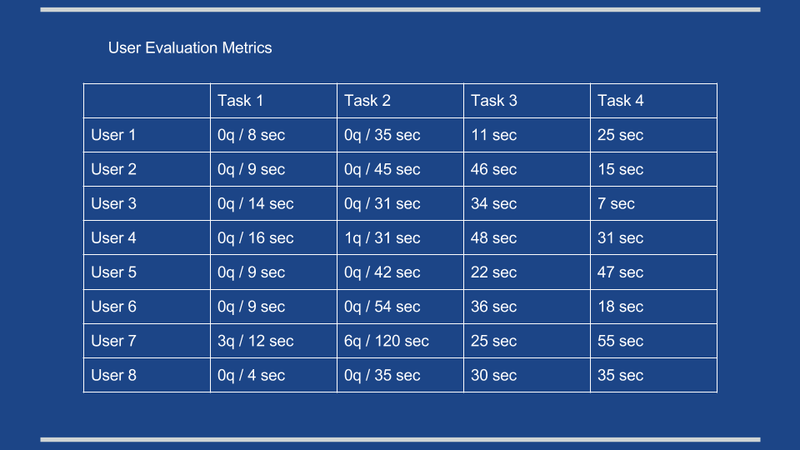 Accessing secured environments requires the users to take on the burden of memorizing codes and/or carrying badges. 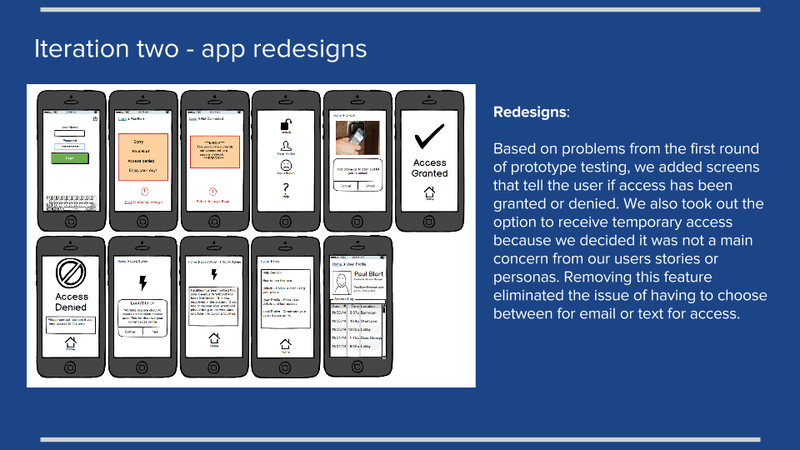 Using door codes and badges introduces breakdowns when users fail to remember codes or forget their badges. These issues affect employees, vendors, visitors, emergency responders, building management, and system administrators leading to a loss of productivity due to stakeholders forgetting badges/access codes. A successful solution would transfer the burden from the stakeholders to the security system while keeping the environments secure. Users have issues with remembering codes and badges required for the secured environments. Also, there are workarounds with users piggybacking off of other users’ resources/protected information. Cerberus is designed to solve issues around to building security. This product is a response to issues common in current security systems that require passcodes or keycards to access secured areas. We have developed a hands-free system that allows users to gain access within the building. Cerberus Wristband is wearable -- with built-in NFC chip technology. The Cerberus wristband allows for hands free access to secured environments in an office building without the burden of memorizing codes and/or carrying badges. 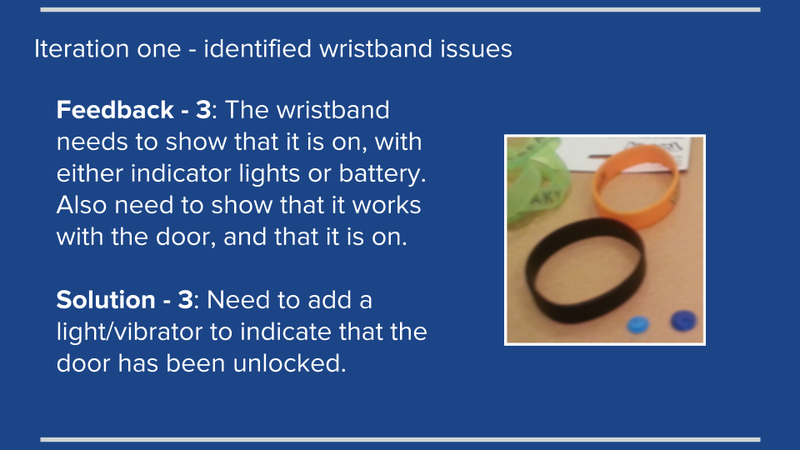 Cerberus App was designed in the event that the Cerberus Wristband is lost, stolen, or left at home. The Cerberus App not only allows access to secured environments, but also logs user activity. In order to prevent security concerns associated with piggybacking, facial recognition technology is used as added security so all users that pass through a secured entrance are accounted. 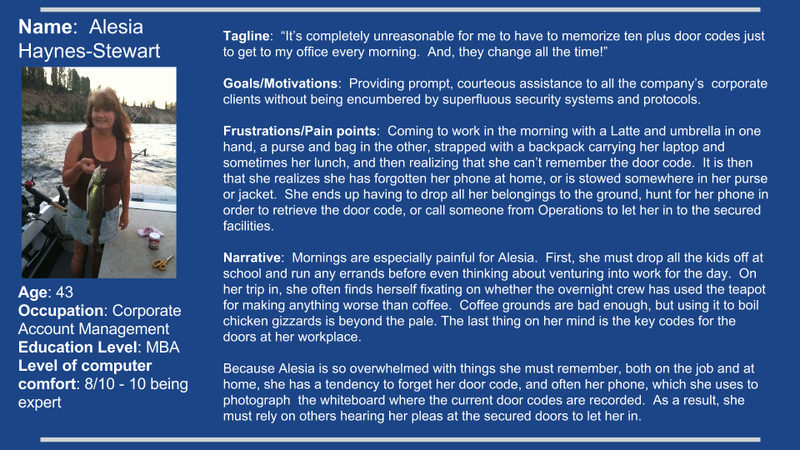 We set out to create for personas of four different types of users that would need access to secured areas within an office building. Thinking about the diverse needs of individuals in a shared commercial space would allowed us to broaden our understanding of the business requirements. 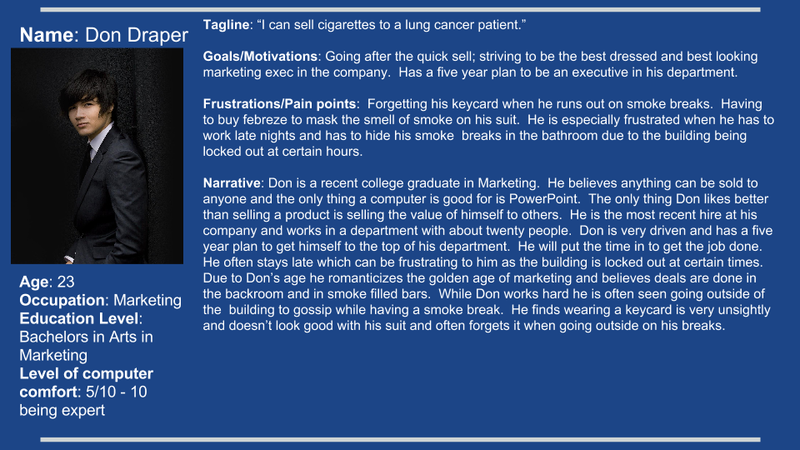 The persona information included: name, age, occupation, education level, level of computer comfort out of 10, tagline, goals/motivations, frustrations/pain points, and a short narrative. "As a small business owner, I need a security system to protect my employees, equipment, and intellectual property." Alesia needs a way to access the secured environment without using her hands so that she doesn’t have to put down her bags to get inside. "As a building manager, I need to make sure that the secured doorways meet Americans with Disabilities Act and Occupational Safety and Health Administration standards." 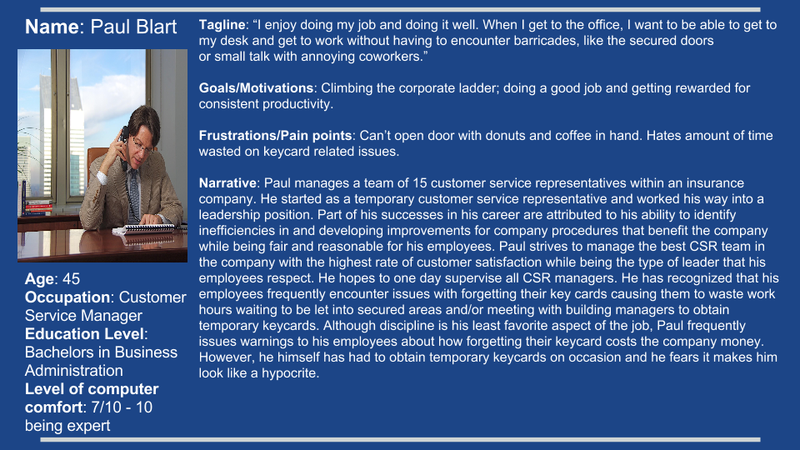 Paul needs to pull reports from the security system in order to ensure his employees are arriving for work on time. "As a career woman and mother, I need to be able to access secured environments seamlessly to keep up with my fast-paced lifestyle." 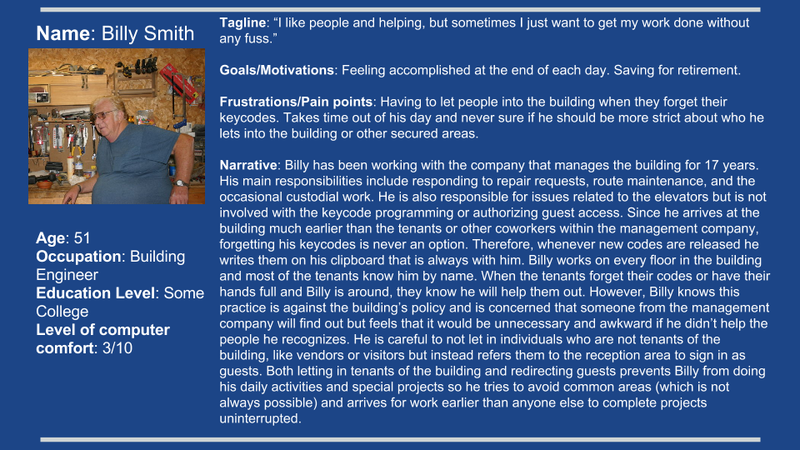 Billy needs security monitoring on an individual user-level in the case of emergencies to have the ability to track building occupancy. "As the building engineer, I require one central administration overseeing security so that I don’t have to be responsible for guest access procedures." Don wants the burden of security to be left to the system so he can focus on his job. With no revisions needed to the wristband, the following are the third and final round of mockups based on the feedback from round two. We added a Cerberus Logo splash page for when the app opens and is loading and a welcome splash page to let the user know they have been logged in. We also added a call button to the access denied screen. We removed the labeling of the facial recognition camera on the sensor screens and added a call button for the access denied sensor screen. Participants are aligned as general users. Our participants are representative of 3 of the 4 personas that were created. The following is a video featuring two participants of the user tests. Tests moderated and video edited by Elaina Boytor (me). App unlock had incorrect wording - The prompt says “hit yes to unlock” - yet the button is labeled “unlock” not “yes”. Difficult for users to ascertain that from the sensor screen they can call facilities. 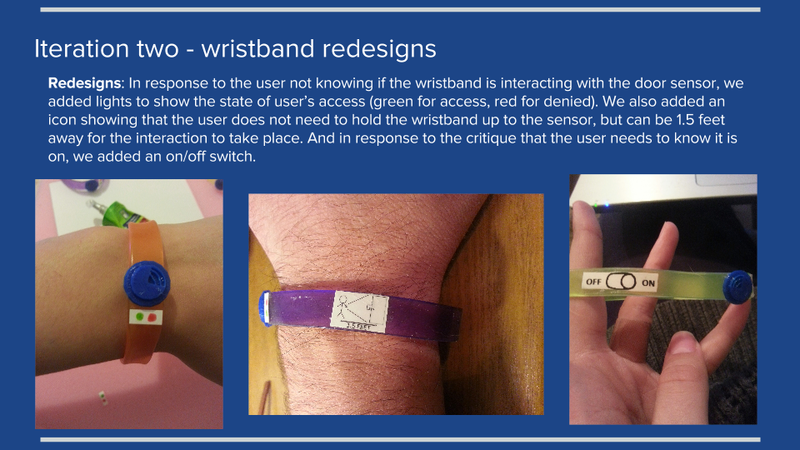 Users have a tendency to hold wristband next to sensor (7 out of 8 users did this). While 62% preferred it as a wristband, 38% would like to be able to insert the security device into a carry-on item. Based on the comments on four users about the necessity and/or obtrusive presence of the off and on switch, we would remove the switch. Since it was included with the intention of indicating to the user that it would interact with the sensor, we believe that the responses from the sensor screen showing access granted or denied will suffice.